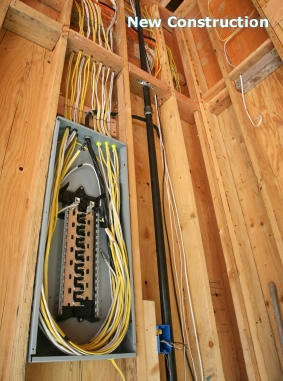 We offer a variety of electrical services for both the general contractor and the homeowner. From new construction, remodel to basic service and repairs. The most important concern that homeowners consider when it comes to selecting an electrical contractor to come and work in their home is trust. How can they be sure that the contractor they select will perform the work while respecting the sanctity of their home? This is quite naturally, even more important than how much a contractor will charge for the work. Pro Circuit Electric has made developing personal relationships with people the most important thing we do. We treat everyone the way we ourselves want to be treated. Our clients trust us implicitly because we have earned their respect and trust over the entire course of our history. We are licensed, bonded and fully insured. We have never had a complaint filed against us because we adhere to the principals of excellence and integrity in everything we do. We encourage you to check our record with the State Licensing Board before you consider doing business with us or engaging any professional you would have come into your home. If you would like to check us out, click on the following link and enter our license number #501436.